20-Series Performance matched to fit Sub-Compact tractors up to 30 HP, the 20-Series snow pushers are sized to the tractor for maximum snow removal. 24-Series Engineered to fit Sub-Compact and Compact tractors up to 50 hp. These snow pushers are job matched to the tractor for maximum performance. View our literature. 36-Series Engineered for Skid Steer loaders and Utility tractors from 50-125 hp. (depending on model). These Snow Pushers consistently deliver the high performance today's large property owners demand. View our literature. 20-SERIES SPECIFICATIONSfor Sub-Compact tractors up to 30 HP, Max. operating weight 1,800 lbs. 24-SERIES SPECIFICATIONS for tractors using John Deere 200/300/400 attaching system on tractors up to 50 HP, max. operating weight 3,500 lbs. • Models designed for Sub-Compact tractors up to 30 HP. • Adjustable skid shoes of AR-400 material. • End plates with gentle slope design. 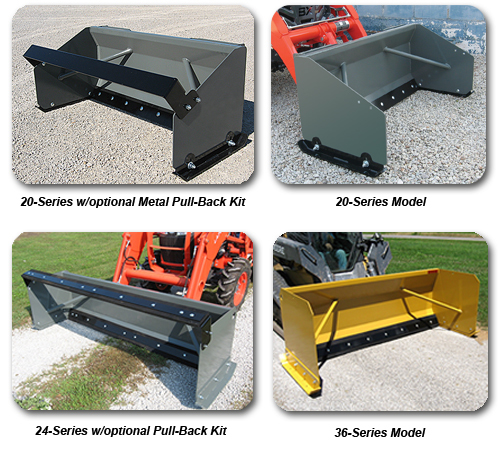 • Models are available to fit “Universal” skid steer attaching system and John Deere hook & pin quick attach. • Optional Metal or Rubber Edged Pull-Back kits available. • Available in widths of 4' or 5' with either a ultra rubber edge or alloy steel cutting edge. • CNC formed 11-gauge moldboard with formed 10-gauge back brace for strength and durability. • Engineered to fit Compact and Sub-Compact tractors. • Replaceable 1” x 6” reversible rubber cutting edge is standard on “R” models. • Models to fit loaders with “Universal” skid steer attaching system. • Models to fit John Deere 200/300/400 series loaders with quick attach system. • All models feature adjustable & reversible skid shoes of high abrasive resistance steel. • Designed for Skid Steers and Tractors equipped with a loader, the 36- Series Snow Pushers are job matched for maximum performance. • Adjustable & reversible 1.5” x 8” premium rubber cutting edge. • CNC formed 7-gauge moldboard, 5/16” end plates with 4-inch wide reversible skid shoes of abrasive resistant steel. • Models are available to fit “universal” skid steer attaching system, John Deere 400/500 attaching system and the Global / Euro tool carrier.